My name is Rajesh Kamath and I work as a Principal Enterprise Architect for Oracle India. My master’s degree in Physics and 19+ years of work in the information technology industry have resulted in a brain that veers overtly to the left and is used to structure, organization and analysis paralysis. In this narration, I am unimportant, insignificant and irrelevant but choose to mention my background only to point out the fact that my writings are not the product of an infatuated mind. Far from it, these are the observations of an overly skeptical mind that grudgingly accepts things out of the ordinary only after rigorous analysis has failed. And more often than not, it takes repeated observations to drive the message home and hammer it in place.  We all know that Mohanji used to travel with a lot of people in the past. But his recent decision to travel alone has given a few of us a great opportunity to exclusively be with him. This also gives us a chance to witness him up close and personal. His interactions in a large group always get diluted from an individual’s perspective since there are a lot of group dynamics in play. But there is no escape from the full heat and speed when you pitch yourself alone with any Master connected to the Source. While it is wonderful to watch the spontaneity and unfolding of events as we move on, it is very taxing to an organized mind recalculating the next turn at almost every point in time. A Master destroys the expectations and plans and keeps us fluid as well as flexible at all times. There is no choice here. Perhaps, the only choice is whether to travel and face the uncertainties of being with a master or stay on the beaten track of familiarities and predictabilities that our conditioned mind is used to. Thankfully, I chose the former option because I was well used to and bored with the mundane existence where the predictability was chewing on my bones. The comfort zones of daily life are traps. Predictability is a trap. Stagnation is a trap that we do not even know exists in our life. This is the tragedy of human existence. There is no evolution possible unless we take the plunge. It’s always safer to take the plunge in the sea under the watchful eyes of the Coast Guard. Hence if you choose to destroy your predictability and comfort zones, it might be a good idea to take the walk on the wild side with a master expecting the unexpected. 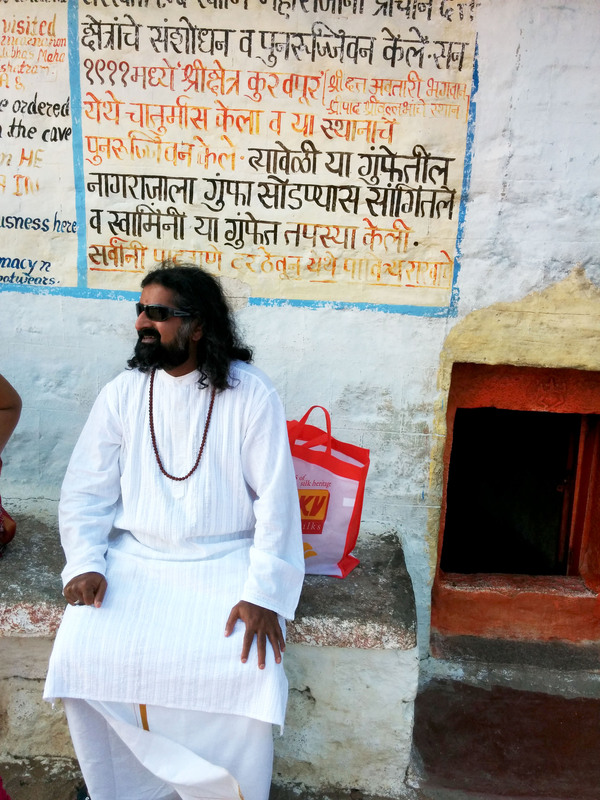 After the Rishikesh retreat in October last year, Mohanji asked me to spend more time with him during my one-on-one with him. When I found out from my “sources”  that Mohanji would be in Dharamshala around New Year’s Eve, I relished the thought of spending some time with him. I checked with him and he accepted my request. Even though you may feel that it is so easy to get to travel with Mohanji, my experience is to the contrary. I had spoken to his P.A., Sandeep Mishra, and booked tickets for Dharamshala to be in his presence at least for a few days. Suddenly, I was informed that Mohanji was going to the south of India at the same time. While this communication was going on, I came to know that a group from Germany had come to Delhi to meet Mohanji but could not meet him due to his changed plans. This made me realize that it takes much more than an appointment to be with a true Master. I understood that Mohanji is not deliberately shifting the goalpost. He is just flowing with the need of the time. Later experiences during travel were a clear realization that he was at the right place, at the right time for the right purpose. He could not have been elsewhere at that time. There was such perfection. And those who could join him had something to do with it. One important factor is that there is a clear aspect of fulfillment with every move for someone throughout the journey. Before traveling with Mohanji and while traveling with Mohanji, this realization got strengthened. That Mohanji is spontaneous. There is no concrete plan. At the same time, each movement has perfection. He wouldn’t perhaps do that when he is with a group because the group’s emotions are taken into consideration. I had decided that I wanted to spend some time with Mohanji irrespective of whether he is alone or with a group. I had absolutely no visibility in the last 10 days leading to the start of my vacation. There was quite a lot of uncertainty on where Mohanji is going, whether he is going and whether I would be allowed to join. It was as if my resolve was being tested. Since I had decided to be with Mohanji, I didn’t want to take a step backwards and decided to hang in there and go with the flow. Finally, a few days before the start of my vacation, I got the green signal that I could join him in Bangalore. What started as a few days with Mohanji ended up getting extended to three whole weeks. What I have realized over these three weeks is that a true Master who is connected to the Source has no insecurities and fears. The questions like “What next? Why? How?” have no value in their life. They live in the moment and make you live in the moment. They could fool you with their expressions of seeming anxiety, anger and such emotions. But they never stay. It’s like a flash in the pan and it is usually a reflection of the constitution of who they are interacting with. They do not have any set emotions stored and repeated like ordinary people. They are not judgmental. They allow you your freedom and easily forgive your follies with a slight tease or joke. More often than not, they work as removals of bugs, gaps or constraints in our constitution. A seeming ordinary word or movement could be a surgery of removal of tumor from the past. Their seeming anger is almost always for the sake of removal of hard blockages, an inherent negativity or a distracting entity or even a hardened habit based on karma. To understand the operating levels of a true Master, a true seeker should transcend the seeming contradictions in their expressions and connect to the spontaneity, flexibility and detachment in every moment. Nothing is stored. Everything is distributed. They always remain an empty vessel. If you imitate them, it affects your progress. If you flow with them, you will attain the highest. If you are witnessing contradictions, you have miles to go. If you are witnessing spontaneity, flexibility and consistency with the unity of consciousness, then you are on the path of progress. Even their seeming inaction could be a delusion masking a dynamic action elsewhere in the realms of consciousness. It takes divine eyes to see and a rich heart to perceive. Another big learning was inculcating the spirit of giving. Mohanji says, “By acquiring, we become more and more entangled with this world. Detachment becomes difficult as positions increase. Possessions also lead to possessiveness. Greed takes over. The more we have the more we need. We then withdraw into a cage created by ourselves for ourselves with walls of fear. The stronger the cages, the more lives we take. Man is a bundle of concepts. Concepts become the cement for the wall of fear. Insecurity is its coating. Intolerance is its expression. Soon, life becomes out of control. Instead, be good, do good. Be and let be”. Through giving, we are liberated. Mohanji expresses the culture of giving. He likes to feed more than eat. He told us that feeding the hungry (annadana) is one the greatest sevas we can do to alleviate the suffering of mankind. He reminded us throughout our journey to feed as many stray dogs, animals and people as we could and get the merit of annadana. Dogs have a special significance in the Nath tradition with dogs portrayed around Lord Dattatreya and several Nath saints. The four dogs portrayed around Lord Dattatreya signify the four Vedas with Lord Dattatreya as the protector guarding the dharma. He asked us to carry biscuits or bananas to feed monkeys, dogs and other animals, and birds along the way. There was always a spontaneous feeding happening which was not planned. For people who were begging, we were giving food. Mohanji emphasized that giving is the best way to develop richness of heart. Without further ado, I relate a summary of my experiences on this trip. On 28th December 2014 we headed for Vallabhapuram early in the morning. 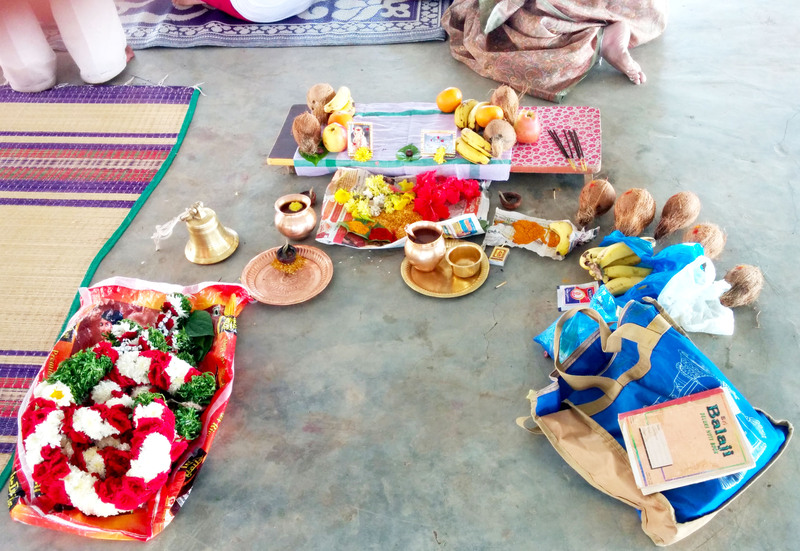 Mohanji had to be in Kuruvapuram to attend the engagement ceremony of a devotee’s son, whose family had been closely associated with Vittal Babaji. As we were driving down to Vallabhapuram, one amongst our group wanted to connect with Mohanji to get a feel of his energy and consciousness. She closed her eyes and meditated while holding Mohanji’s hand. After a while, when she came around, she mentioned that she had the experience of unity through a vision of the universe within a single atom. Her daughter, who is very connected to Mohanji, also had a similar experience. I felt a tad jealous at being left out of the divine experience and made peace with myself (with a lot of effort) that it would be bestowed when it was my time to come. We had an impromptu satsang in the car with Mohanji answering questions that were posed to him. We finally reached the Vallabhapuram ashram around noon. 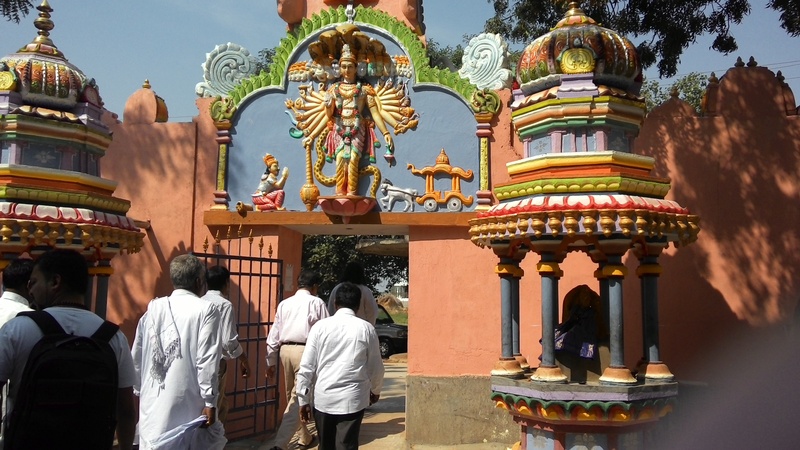 The ashram has been built in a typical south Indian architecture. The entrance has a beautiful statue of Lord Vishnu standing on a lotus with a canopy of Shesha Naga over him. 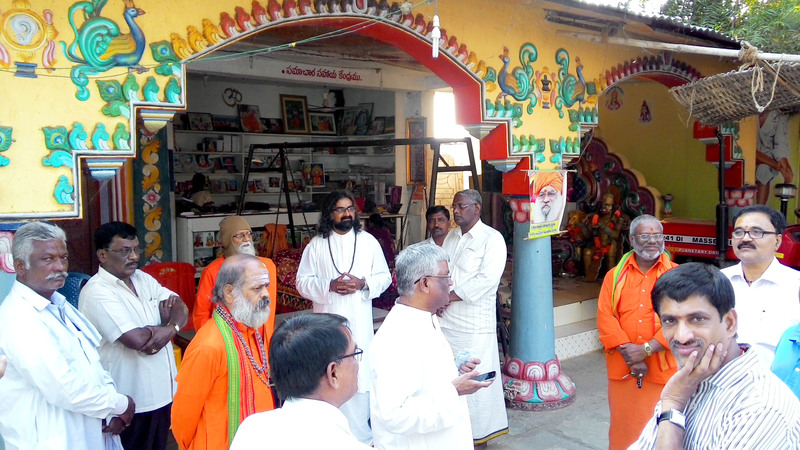 We walked through the entrance to an open area where we were welcomed by the Vittal Babaji ashram trustees along with the pontiffs and mendicants associated with Vittal Babaji. Everyone was very happy to see Mohanji. They hugged him and prostrated in front of him. 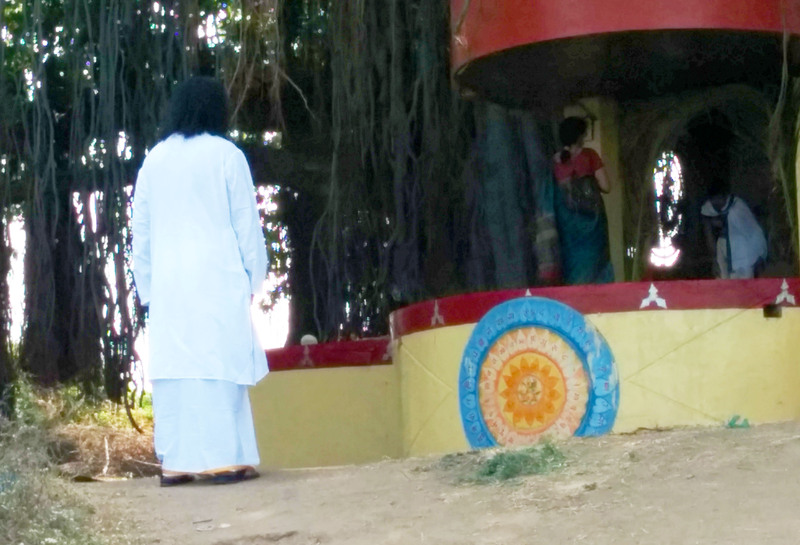 As we walked towards the ashram building, we came to a swing in front of the building where Vittal Babaji used to sit. Behind the swing is a beautiful statue of Sai Baba seated on a high throne and a statue of Lord Hanuman kneeling beside him. 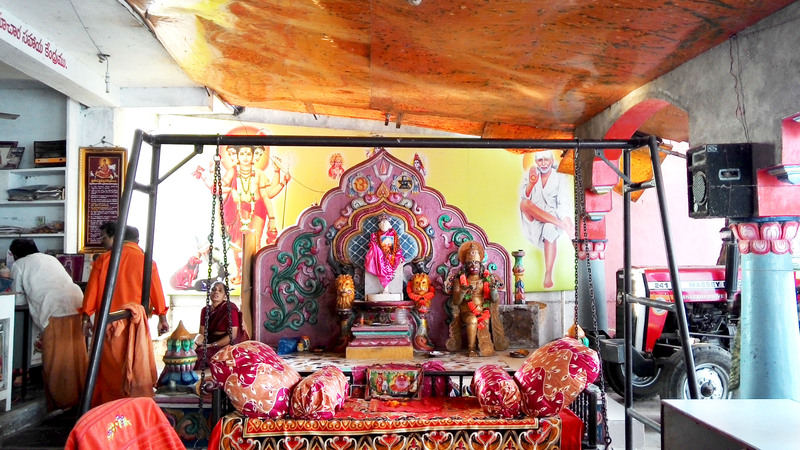 The walls behind the statue are adorned with murals of Lord Dattatreya and Sai Baba on either side. Mohanji prostrated in front of the swing and offered his pranams to Vittal Babaji. After that, the people assembled there took us on a brief tour of the Vallabhapuram ashram. The various temples are housed in a building in front of the ashram building and there is a temple of Lord Dattatreya towards the right. 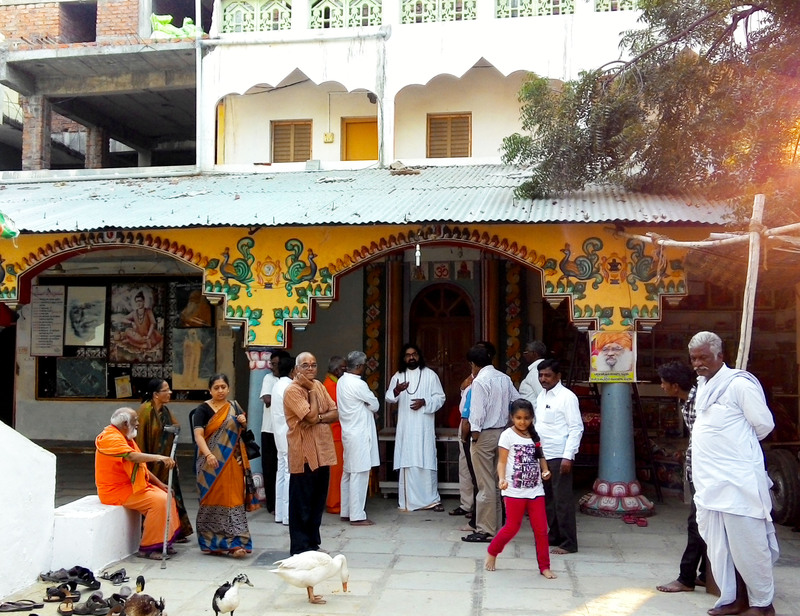 We visited the place where Shreepad SriVallabh meditated, conducted discourses and held his durbar (public court). As we came out, Mohanji fed the ducks in the ashram out of his hand including a white duck that we were told was wailing since the samadhi of Vittal Babaji. The devotee had waited so that Mohanji could be present during the engagement. 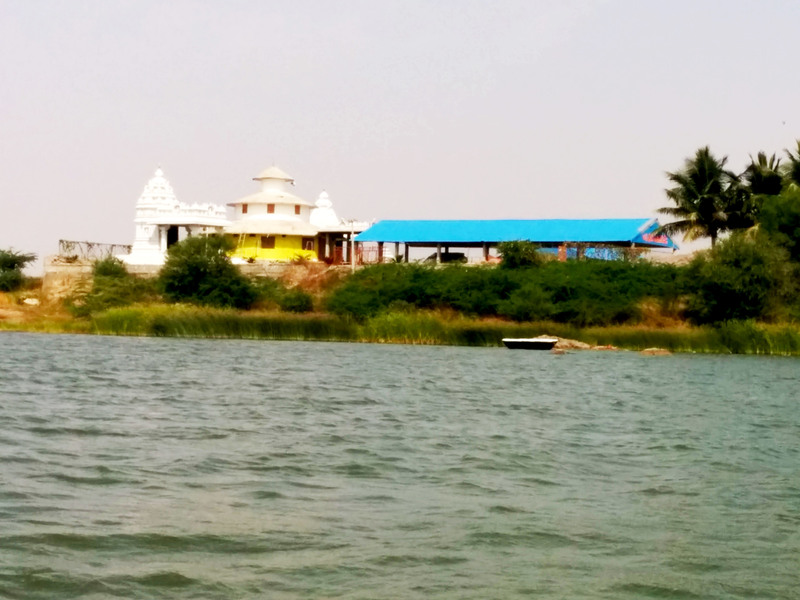 So we had to curtail our tour of the ashram and head out to the other side of the Krishna River to Kuruvapuram. The Shreepad SriVallabh temple in Kuruvapuram was where the engagement was supposed to take place. The devotee had arranged for boats to ferry us across the river. At the banks of the river, Mohanji was greeted by the dog that he had blessed and healed in the past. I had been told earlier by Preeti Duggal about the miracle regarding this dog. On a previous occasion when Mohanji visited Vallabhapuram, this dog was partially burnt by tar. He came towards Mohanji and looked him in the eye as if asking for help. Mohanji blessed him with healing. Since then, he had completely healed with Mohanji’s grace. Ever since, the dog came to Mohanji whenever he visited Vallabhapuram and walked with him wherever he could. Mohanji fed the dog some biscuits and blessed him. 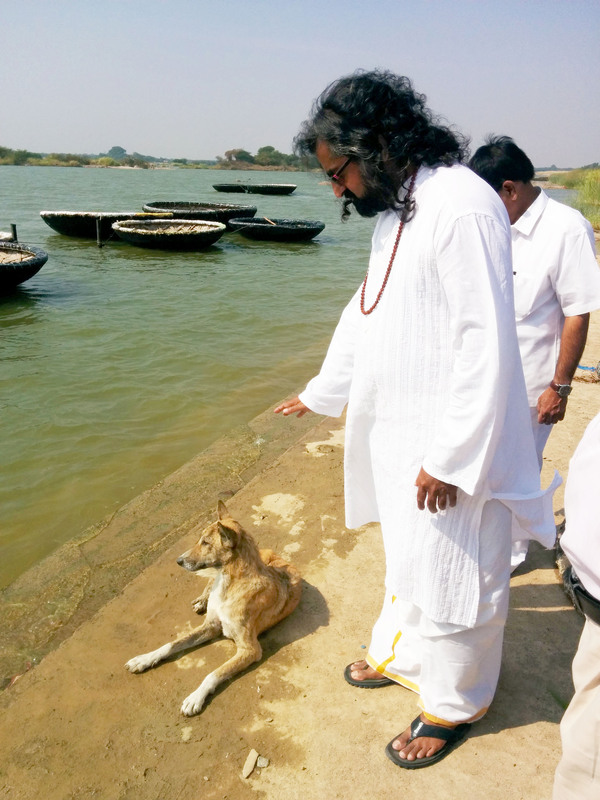 The dog followed Mohanji along the banks and basked in his blessings and bliss. As we got onto the boats, Mohanji became our tour guide and gave us an overview of the entire place including certain spots in the river. A beautiful day and a gentle breeze made it a truly pleasurable experience for us as the saucer shaped boats gently rocked by the Krishna River. Unfortunately, we could not have the darshan of the blessed stone, where Shreepad SriVallabh performed suryanamaskar (sun salutations), which was submerged due to the high water levels. After reaching the other bank of the river (Kuruvapuram), Mohanji led us to the 1000+ years old holy banyan tree under which Shreepad SriVallabh gave discourses to the celestial beings in the night. The tree is a tall imposing structure with clusters of thick long roots hanging all around it all the way to the ground. There is a small shrine at the base of the tree. Mohanji spent a few thoughtful moments in communion under the tree. He then asked the lady who was with us to touch her third eye to the roots of the banyan tree. She got a similar experience of Mohanji’s consciousness (as was experienced while holding his hand) from the banyan tree. We then offered our prayers under the banyan tree and headed out to the temple annexe where the engagement ceremony was scheduled. The devotee and his family welcomed Mohanji and took his blessings. The engagement was a low key affair with only the immediate families in attendance. Mohanji was asked to take the seat alongside the priest conducting the ceremony. He was informed and consulted upon the specifics of the ceremony by the priest and the devotee. Mohanji meditated for a while bestowing blessings on the couple. The engagement ceremony continued for a while and our group decided to take leave of Mohanji to meditate in the holy place. Once the engagement rituals were completed, the devotee and his family again took Mohanji’s blessings. The devotee’s son thanked Mohanji for coming down and said that he was deeply touched that Mohanji took the time out of his busy schedule to attend the engagement. 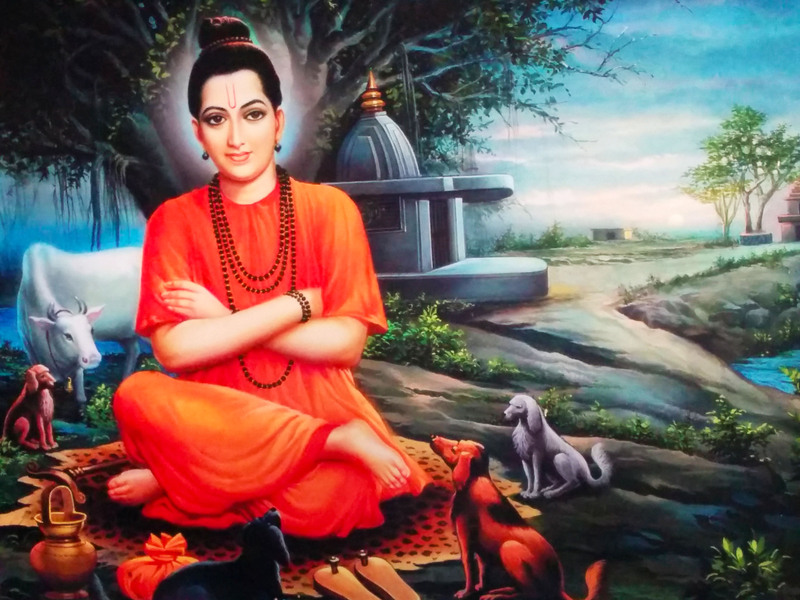 We were told that the devotee’s son was deeply connected to Vittal Babaji and Babaji treated him like his own grandson. He made it a point to spend time in Vallabhapuram with Vittal Babaji during his college vacations. He had since moved to Germany but always went to Vallabhapuram to meet Babaji when he came back to India on leave. With a hint of emotion, he told Mohanji that our family doesn’t feel Vittal Babaji’s absence because we feel that Vittal Babaji left Mohanji in his place. The priest who conducted the ceremonies, Swami Ashwath Narayan, was all love and respect for Mohanji. 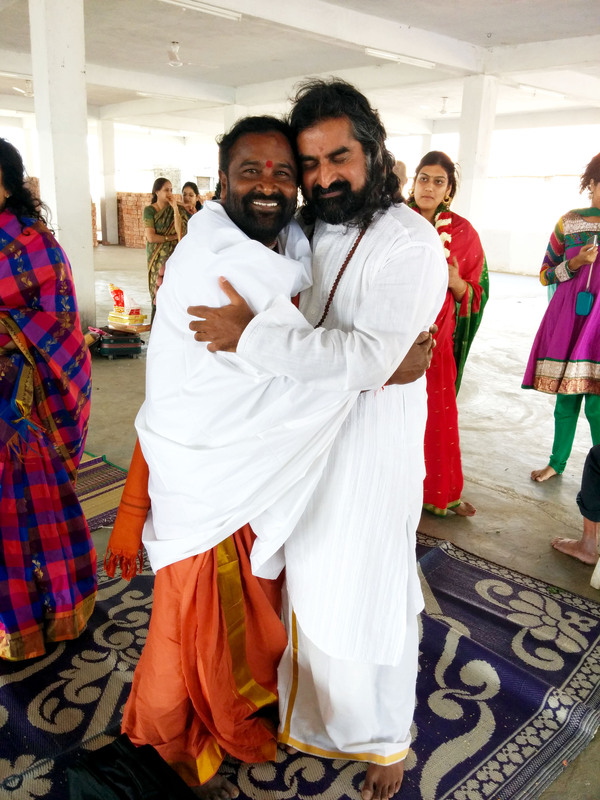 He hugged him and related some of his experiences in Kuruvapuram. He told Mohanji that he had the blessings of receiving visions of Shreepad SriVallabh in this very temple several times. The other people who were assembled for the ceremony also took Mohanji’s darshan. One amongst them was particularly attracted to Mohanji. He looked at Mohanji with intense devotion and prostrated at his feet. He introduced himself as a senior official serving at Puttaparthi. He deeply connected with Mohanji and was emotional about meeting him even though he had never met Mohanji before. He requested Mohanji to visit Puttaparthi. Mohanji considered the presence and invitation of this pious gentleman as an invitation from Bhagavan and accepted the gentleman’s request. The gentleman said that he would personally take care of our group’s arrangements in Puttaparthi. The priest then took us to partake of the prasad served during lunchtime in the temple. He was personally taking care of Mohanji’s needs. By the time we finished lunch, the temple had already closed down. But the priest took us along and got the administration to open the temple. Since admission to the sanctum sanctorum required traditional clothes, the priest arranged for dhotis for our group. Our entire group had a lovely darshan. Of particular note is a strikingly beautiful and lifelike photograph of Shreepad SriVallabh in the temple courtyard. 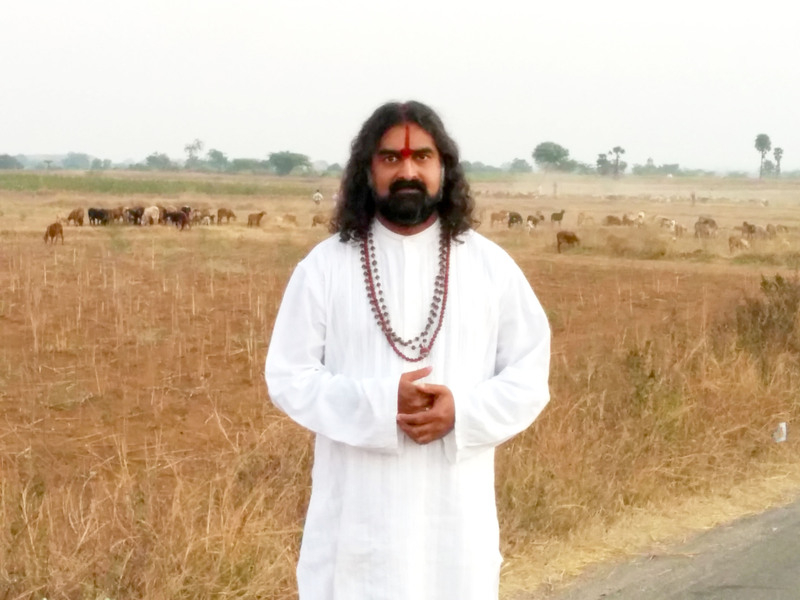 We decided to head back to the ashram and started walking back towards the river bank. Mohanji asked us to do annadana and feed the children and old people. We again took the darshan of the holy banyan tree. From there, we went to Tembe Swami’s cave. 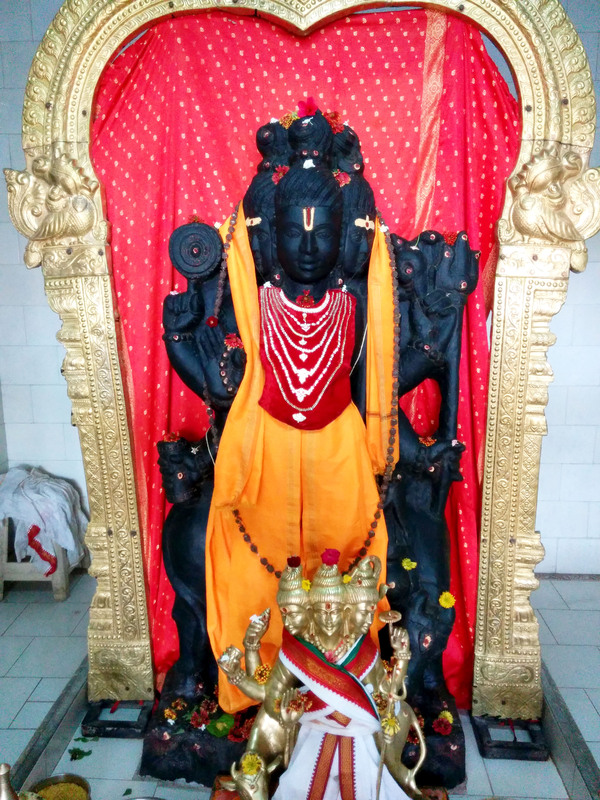 Tembe Swami (Sri Vasudevananda Saraswathy) is a prominent master from the Nath tradition. Outside the cave, it was written that Tembe Swami rediscovered the spiritual significance of the Datta Kshetra (place). He entered this cave and ordered the snake in residence to leave the cave and did penance in the cave. We entered the cave with a lot of reverence and meditated in there for a while. The vibrations in the cave were very intense and it was a beautiful experience. 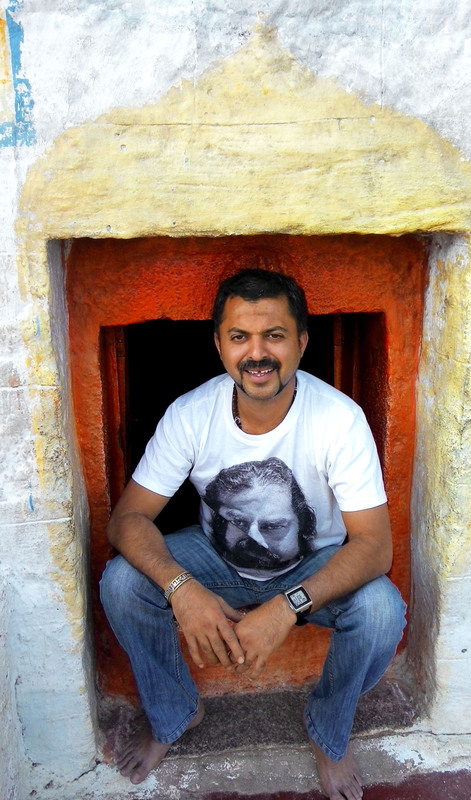 After our meditation session, we hung outside the cave for a while taking pictures of Mohanji. A guy in a lungi (casual loincloth) came out of a small room near the cave. He approached Mohanji and told him that an avadhoota had told him in a vision to come down to Kuruvapuram and he would meet his guru there. He had been living there since a couple of months and meditating in these parts. Mohanji told him to stay completely rooted and connected to the spine. This would help him to make the desired progress. 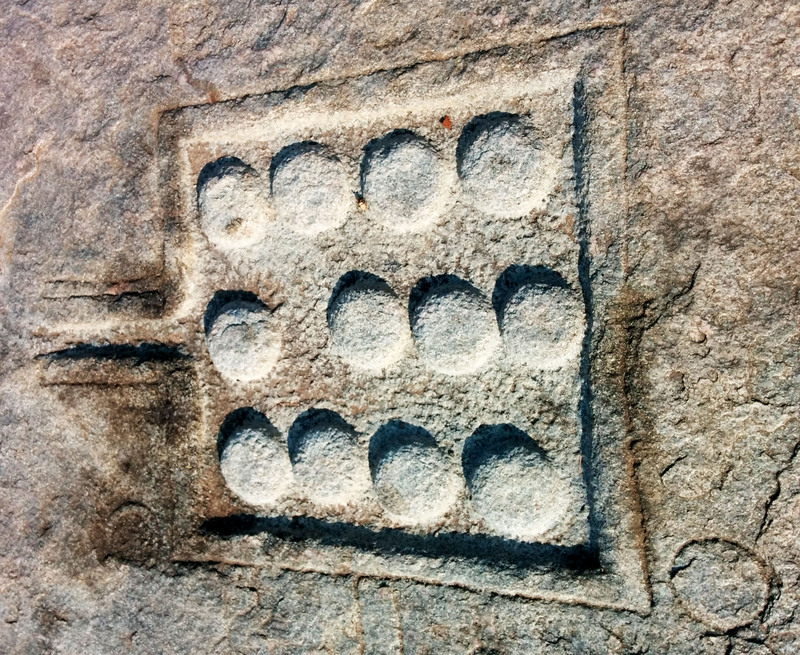 Mohanji then took us to the place where Shreepad SriVallabh carved 12 mini-Shiva lingams in the stone with his toe. Mohanji asked the lady to touch her third eye on each of the mini-Shiva lingas to get a similar experience of consciousness (as was experienced while holding his hand). Mohanji mentioned to her that the intent of doing the exercise with different mediums was to demonstrate the common thread of consciousness flowing through everything. He asked her to henceforth try and experience this consciousness everywhere. 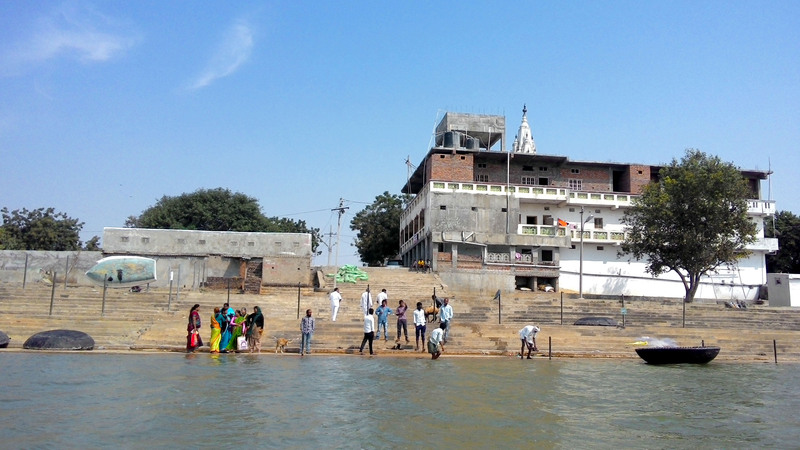 Finally, we made it back to the river bank and got into our boats to head back to the ashram. Along the way, we saw a big snake slithering through the water. 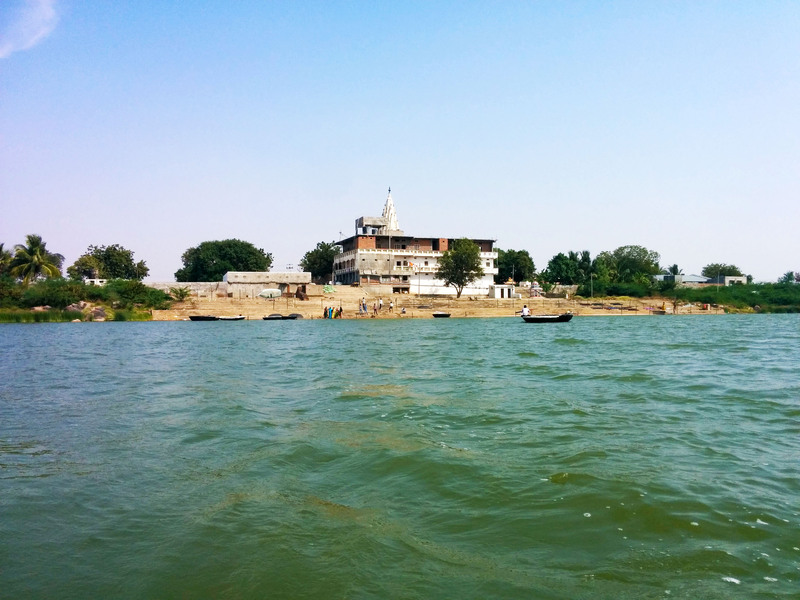 Mohanji related the experience of a devotee who had seen a naga devata in the form of a snake in these waters. 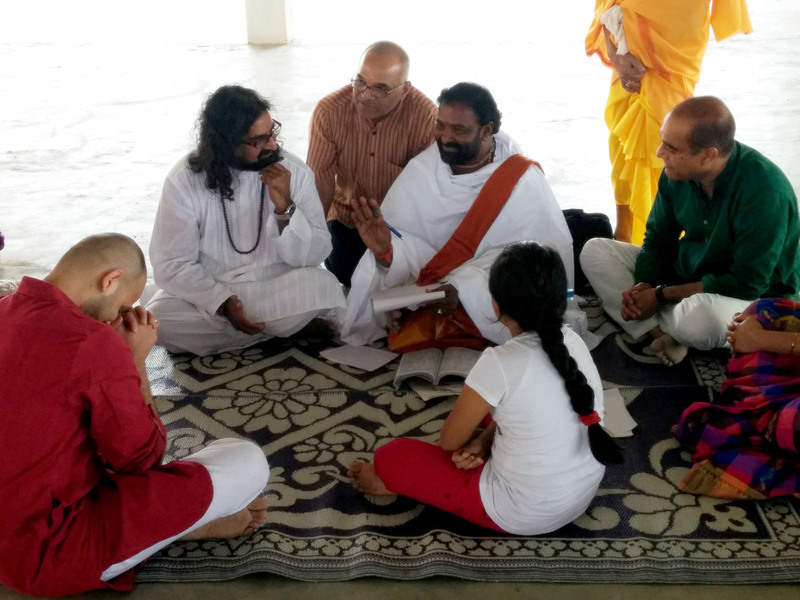 After we reached the ashram, Mohanji met with the trustees and pontiffs. We used this time to visit the beautiful temples in the ashram. On an earlier visit, a devotee had requested Lord Dattatreya’s grace for successful completion of the Kailash Yatra with Mohanji. In return, she promised to do 108 pradakshinas (circumambulations) of Lord Dattatreya. She tasked me to complete the 108 pradakshinas around the Dattatreya temple to fulfill the promise on her behalf. I had a beautiful experience while circumambulating the temple. The rest of the group meditated in the temple. A child from within the group had a beautiful vision of Lord Dattatreya and was moved to blissful tears. We then went to the apartment in the ashram that had been gifted to Mohanji by Vittal Babaji. The apartment was still in the process of being constructed. 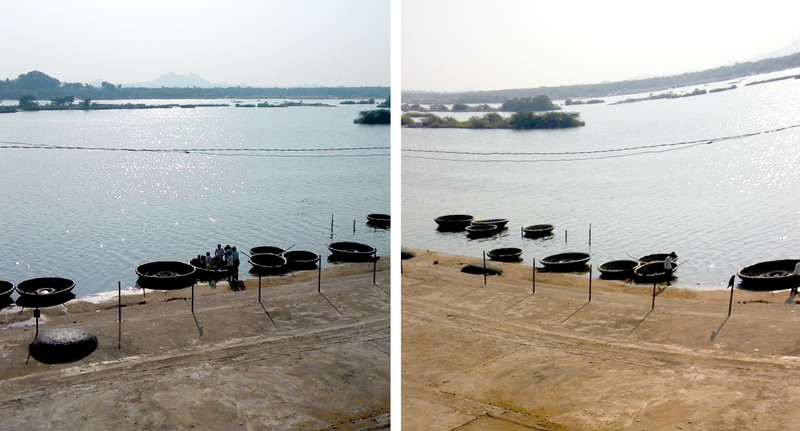 We ventured into the balcony and saw the amazing view against the backdrop of the Krishna River. From there, Mohanji went to the samadhi temple of Vittal Babaji. Since the temple was closed at that time, the trustees opened the temple to allow Mohanji to take darshan. 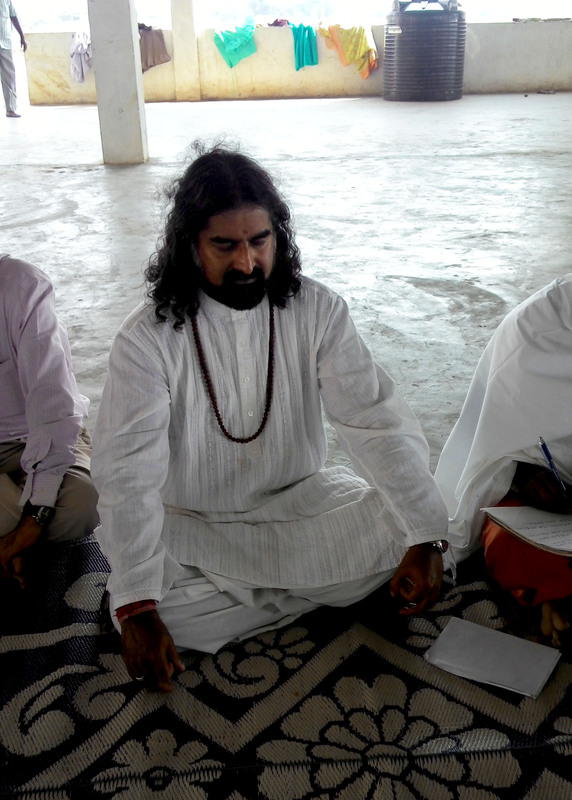 Mohanji prostrated and offered his pranams at Vittal Babaji’s samadhi. We then went to the Naga Devata temple outside the ashram. This is quite an interesting sight. There are several stone idols and images of naga devatas on a stone platform. In addition, there are several anthills surrounding the place. The idols, the platform and the surrounding areas have a yellow ochre tinge like turmeric. We were told that this place is considered to be a portal to Nagaloka (the abode of the Naga Devatas). Mohanji and our group offered our pranams to the Naga Devatas. Finally, it was time for us to leave Vallabhapuram. The ashramites closely associated with Vittal Babaji were emotionally moved when it was time for Mohanji to go. With heavy hearts, the trustees, the pontiffs and the others bid Mohanji goodbye. Our next stop was to meet a swami, Swami Thyagananda, who had specially travelled all the way overnight from Hyderabad to meet Mohanji even though he was recuperating from an accident. He had arrived there in Vallabhapuram with his small group and was staying close to the ashram. We reached the place very soon and were taken to the room where Swami Thyagananda was waiting for us. 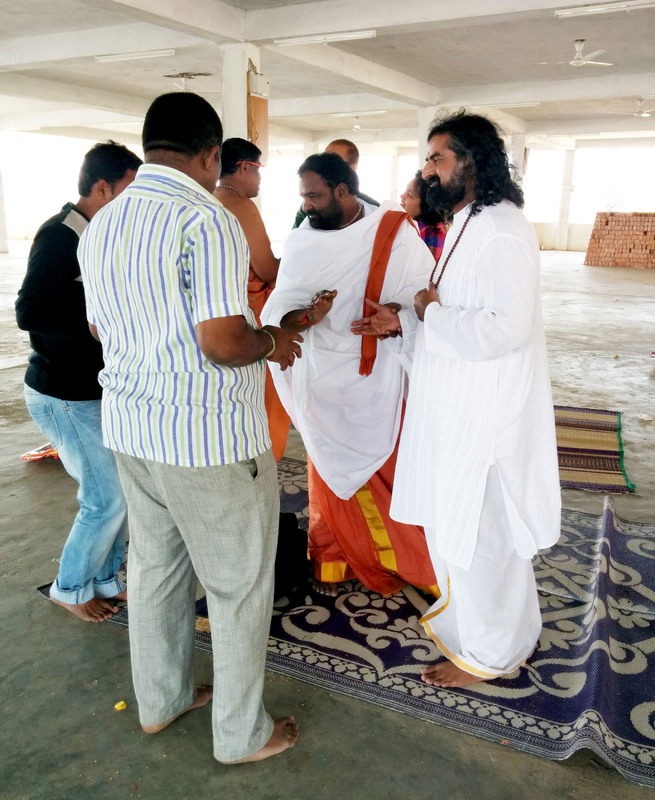 Swami Thyagananda spoke very little English and mostly conversed in Telegu. When he saw Mohanji, he looked at him and said “powerful eyes”. He kept trying to say something but was choked with emotion. He then closed his eyes and went within. When he came around, he looked at Mohanji and told him that your ajna chakra (third eye) is very powerful. He touched Mohanji’s heart and told everyone around that he is Shiva Tattva (the essence of Shiva). He then made a request in Telegu to allow him to transfer his siddhis (divine powers) and Mother Durga’s shakti (power) to Mohanji. He asked people to translate his request to Mohanji and get his permission. 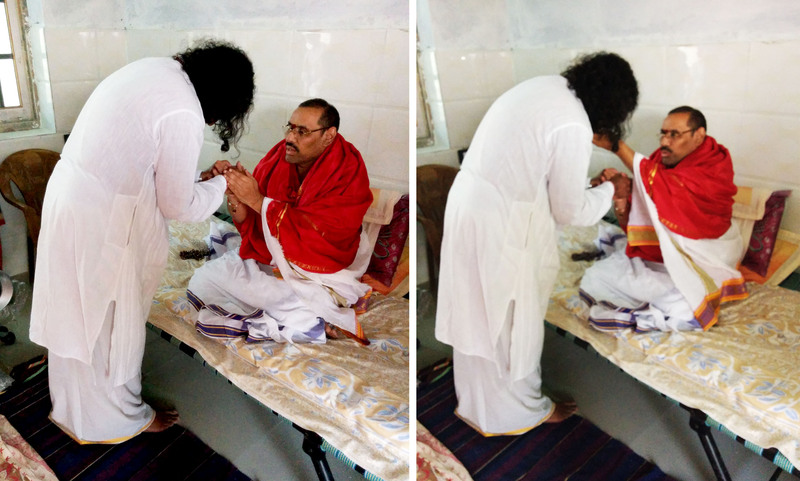 Mohanji accepted his request and kneeled before him in reverence. Swami Thyagananda then proceeded to recite mantras in his booming voice. The whole place was soon charged with divine energy. It was so palpable that you could feel it in the air. Our group was really blessed to be there to witness this divine play. My hair stood on end as I could feel the mantras and the corresponding energy coursing through my being. When the ritual finally ended, Thyagananda Swamy anointed Mohanji with red sindoor on the third eye all the way up the forehead. He said that, “I work in a small corner of the universe. These powers are not of much use to me. But you have a lot of work to do in the world and this will help you in your divine mission”. Mohanji’s eyes were so intense after this and the red sindoor tikka (mark) on his forehead made him look like Shiva ready to burn up the world. Love was pouring from Thyagananda Swamy’s being for Mohanji like a mother. He kept caressing him and patting him. He touched Mohanji’s heart and told us that this heart has only pure love. He then took out a long rudraksha mala (string of prayer beads) and put it around Mohanji’s neck. Then he narrated the story of the mala. This mala was worn by his Guru’s Guru Swamy Poornananda. He said that Swamy Poornananda had done 100s of millions of japa (chanting) on this very mala. Swamy Poornananda attained mahasamadhi (the act of shedding the body) on April 6th 2000. Before his mahasamadhi, Swamy Poornananda told Swamy Thyagananda, “One day you will meet Mohanji and you need to give this mala to him”. Swamy Thyagananda asked Swamy Poornananda, “How will I recognize him?” Swamy Poornananda said, “You will recognize him by his third eye. Mohanji will have a third eye which will be bright like the blazing sun”. Swamy Thyagananda told us that he had doubts about Mohanji when he left from Hyderabad – whether Mohanji was a real Guru and whether Mohanji was the person he was supposed to hand over the mala. But now that he had met Mohanji, he was convinced that he had to come here to accomplish the task, of handing over the mala, entrusted to him by his Guru’s Guru fourteen years ago. You are so blessed to be a witness of this divine mission. its an immense blessing for me to read and view the divine photos and narration of Mohanji and sripada swami. Reading and looking itseft has took us a step forward in life. Gratitude from my heart for posting this Ji. Wonderful experiences! Thank you so much for sharing it with us. I truly enjoyed every sentence and I felt as I was there. We are really blessed to live in this time with such Master. This write-up has powerful energy & feelings & more importantly vibrations in it. Wonderful-Jai Sai Ram! Beautiful!!! Such an amazing story. Thankyou for taking time and enlightening others with this truly blessed experience. Definitely you were destined to be part of this journey and make others aware. Wonderful reading experience!! Jai Sai Nath !! I felt all your words. Truly amazing writing, thank you Rajesh!! This will be published in Awakening Times July issue for sure 😉 Much love my friend! Wow Rajesh! Grace is surely flowing through you in this writing…Moved to tears. Thank you very much for sharing this valuable information.